Meal kits have exploded in popularity since the first one hit the market in Sweden in 2007 – there are now more than 150 meal kit companies operating in the U.S. alone. According to Time Magazine, the global meal kit business is currently estimated around $2.2 billion and is expected to grow to capture up to 1.3% of global food and beverage sales by 2020. Food trends are constantly evolving, and meal kits have instigated significant change in the food and beverage industry. These services offer customers the convenience of having fresh, pre-portioned ingredients delivered right to their door as an alternative to takeout and fast food. But how many people actually take advantage of these services and how are meal kit companies adapting to recent changes in the industry? In this article, we’re going to explore the history of meal kits from the origins in 2007 to recent developments in the industry. We’ll also take a closer look at the benefits of meal kits for consumers as well as some of the challenges meal kit companies face to obtain and maintain a base of repeat customers. The idea of receiving a recurring delivery of food items is nothing new. One of the earliest examples is Omaha Steaks, originally “Table Supply Meat Company”, which was founded in 1917 and began a mail order and home delivery service in 1952. This eventually snowballed into monthly subscription boxes delivering niche products like FabFitFun for fashion and wellness items, BarkBox for dog treats and toys, and Graze for healthy snacks. It also paved the way for modern meal delivery services. The first meal kit was launched in 2007 in Stockholm, Sweden. Kicki Theander, Swedish mother of three, created Middagsfrid (translates to “Dinner Peace” in English) to help families enjoy home-cooked dinners without the logistics of meal planning and purchasing. This service delivered bags of groceries to customer’s doors and it was an instant success. The Middagsfrid brand spread rapidly through Germany, Denmark, Switzerland, and Belgium, leaving a collection of competing companies in its wake. There are now more than 10 meal kit companies in Sweden alone, a country with a population less than 10 million. The concept of the meal kit made its way to the United States where it was adopted by millennial urbanites – young people in metropolitan areas who valued convenience. These services appealed to people who had limited access to grocery stores (such as cities like New York where many people don’t have cars) and to people who have enough disposable income to spend on eating well. In a city like New York where the cost of living is already high, a $10 meal is a reasonable expense rather than a luxury. The year 2012 is when meal kit subscription services Blue Apron, Hello Fresh, and Plated all entered the U.S. market and the industry truly started to evolve. Home Chef joined a year later and, by 2015, meal kit food delivery services had generated over $1 billion in sales. By 2016 we start to see explosive growth with over 150 meal kit delivery services joining the industry. Riding the coattails of this growth, in 2017 Blue Apron becomes the first meal kit company to go public, followed by Hello Fresh. Why Have Meal Kits Risen In Popularity? Americans typically spend about 6% of their annual income on food. In order for a single person to eat on a moderate budget, it’s a cost of about $250 per month or $3,000 per year. The average family of four spends over $1,100 on groceries each month. In addition to groceries, the average household also spends over $3,000 dining out. Everyone wants a satisfying meal when they come home from work at the end of the day, but there are different ways to get it. For many people, ordering in or eating out are the go-to options while, for others, meal prep involves making multiple trips to the grocery store each week and spending hours preparing ingredients and cooking meals. Meal kit services were developed to appeal to the customer who wants a home-cooked meal without the hassle of meal planning or grocery shopping. Perfect portions. Many Americans struggle with portion control or even with knowing how much to serve of different dishes. Meal kits come with specific portions so you know exactly how much you’ll be preparing and how much should go on each plate. Fresh ingredients. Meal kits provide easy access to fresh ingredients, including ingredients that are not in-season or easy to find locally. Many kits also offer organic ingredients. Less wasted food. When you buy groceries to prepare a meal, you often end up using half of an ingredient or buying a whole bottle of a spice you don’t typically use. Meal kits come with the exact amount you need for each ingredient to eliminate waste. Healthy options. Many meal kits offer options for specialty diets (like vegan, paleo, or gluten-free) as well as low-calorie or low-carb options. These kits make it easy for people who need help getting started with a diet or maintaining one. Less hassle. Having meal prep ingredients delivered to your door each week saves you the time and hassle of going to the grocery store and planning meals yourself. You’ll also save time washing and prepping ingredients, minimizing the total meal prep time. Cost savings. Meal kits are not exactly cheap, but they can be more cost-effective than ordering in or eating out. You may also save money on high-quality ingredients you might not otherwise have affordable access to, and you’ll save by buying only the amount you need. Novelty. Many people get in the habit of preparing the same meals time and again, but meal kits offer the option of trying new recipes on a weekly basis. Meal kits also make it possible to try different diets or cuisines without making a significant investment of time or money. According to Technomic Research, the majority of meal kit subscribers are older millennials, equally split among men and women. About 47% of subscribers have a household income over $125,000, and about 23% of subscribers rent rather than own their home. Though meal kit services offer a variety of benefits, companies do struggle to keep their subscribers on for the long haul. Over 50% of customers who cancel their subscriptions cite cost as the primary reason. Every industry has its challenges, and while meal kit companies are still trying to figure out how to navigate those challenges, the industry itself is continuing to grow. In 2017, Blue Apron raised $300 million when it went public, offering 30 million shares at $10 per share. Though this number is certainly impressive, it is a third less than the company was hoping for. Blue Apron was the first meal kit company to go public, and other companies have been waiting with bated breath to see how it fares. Since going public, it has gone through some tumultuous times. Over the past decade, meal kit services have developed a loyal fanbase. There are websites (like Food Box HQ) and forums (like https://www.reddit.com/r/mealkits/) dedicated to covering and reviewing different services. While some say that meal kits are just a fad, others think we’re at the precipice of a food delivery revolution. Darren Seifer, a food and beverage analyst for market research company NPD Group, claims that meal kits have the potential to disrupt the food and beverage industry but, as of yet, they are still a little too small. While Blue Apron had over a million subscribers at its peak, Seifer notes that only about 5% of U.S. households have even tried meal kits (as of 2017) but that may be about to change. In June 2017, Amazon announced its $13.4 billion acquisition of Whole Foods. Amazon has already upended a handful of other industries, and its mere presence in the food and beverage market has lead to some drastic changes in some well established meal kit businesses. After a rocky entry into the stock market, Blue Apron stock plummeted by 11% following the Amazon-Whole Foods announcement. Though no formal announcement of an Amazon meal kit delivery service has been made, it’s only logical to assume they are working on bringing a meal kit of their own to market. Meal kit companies are concerned that the acquisition of Whole Foods will provide Amazon with an already-established system for food delivery in the more than 450 Whole Foods brick-and-mortar stores that already exist all over the country. This could give them the foothold they need to take over the meal kit industry, pushing out smaller companies like Blue Apron, Plated, and Hello Fresh. As Amazon starts gearing up for its own meal kit subscription service, smaller companies are forced to reevaluate their marketing strategies to keep their share of the market. What Are the Challenges of Running a Meal Kit Service? The primary challenge every company faces is customer acquisition. When it comes to meal kits, the more pressing issue is the matter of keeping those customers. The rate at which customers leave a service is known in the industry as “churn”. While many meal kits are working on increasing customer acquisition, we often see them neglecting keeping current customers onboard, leading to higher churn rates. However, it’s a catch-22… Since their churn rates are high, they need new customers to stay afloat. If you lose more customers than you gain each month, you’re going to be burning money. Alas, customer acquisition and retention is not an issue for just Blue Apron – it spans the entire range of meal kit services. Profitability is always a concern when it comes to the logistics of packaging and delivering highly perishable products. There’s not much wiggle room in cutting costs. Perishable items have to be delivered safely and efficiently, which drives up costs. Some business analysts remark that meal kit services are an expensive business model and, perhaps, not a sustainable one. Many meal kit companies offer steep discounts on the customer’s first order or offer a free trial period, but the difficulty of retaining new customers is high as well. These challenges have forced many companies to focus their attention on gaining a share of the market instead of simply on their bottom line. Gary Stibel, founder and chief executive at New England Consulting Group, states that, “there’s a small segment of the population that wants products like [meal kits], but simply not enough of them to keep all these companies that want to play alive.” Market data shows that meal kit spending is growing three times faster than other channels, but other research shows that many customers don’t like the idea of being locked into a recurring subscription. Meal kit companies like Blue Apron and Plated exist entirely online and therefore struggle to establish and maintain a loyal customer base. Thus, it comes at no surprise that retail is the next frontier for the meal kit industry. In theory, it could represent new hope for grocery stores struggling to compete with the ever-growing online retail market. While Amazon’s acquisition of Whole Foods was certainly some of the biggest food industry news of 2017, other companies have made significant acquisitions of their own. In fact, a month after the Amazon-Whole Foods deal closed, Albertson’s bought meal kit company Plated and Kroger purchased Home Chef. In August 2018, meal kit company Chef’d received $25 million in funding from Smithfield and Campbell Soup and has started selling kits a Gelson’s, a supermarket chain in Southern California. Walmart is also making moves to capture its share of the market. In March 2018, Walmart announced that it would be selling their own line of meal kits in over 2,000 stores within the coming year. The meals are also available via Walmart’s Online Grocery Pickup service where customers can order groceries and pick them up within hours. These acquisitions represent an evolution in the food industry that is not expected to slow down. Meagan Nelson, associate director of Nielsen’s growth and strategy team, suggests that, “we will continue to see more grocery stores get into the game.” In fact, we saw an increase of over 26% in the purchase of in-store meal kits within 2018. According to a 2016 Harris Poll, only about one-third of Americans cook every day and only about 43% enjoy cooking. Of those who don’t enjoy cooking, the primary reason is a lack of skill or experience (35%), followed by a lack of time (31%). For those who do cook, convenience and price are major sticking points. Even with weekly deliveries, meal kit services cost an average of $8 to $10 per serving and there is no “on the fly” option. Having meal kits available in stores gives consumers the convenience of spontaneously deciding to prepare a home-cooked meal instead of having to plan a week in advance. In the future, you can expect to see meal kit services evolve and adapt to the changing industry. Specialty diet meal kits are on the rise, keeping in trend with popular diets such as paleo, keto, vegan, and gluten free. Some companies are even bringing on celebrity spokesmen or releasing themed meal kits. Blue Apron recently teamed up with supermodel and food blogger Chrissy Teigen for six weeks of recipes and is rolling out a series of burger kits based on the animated FOX series Bob’s Burgers. 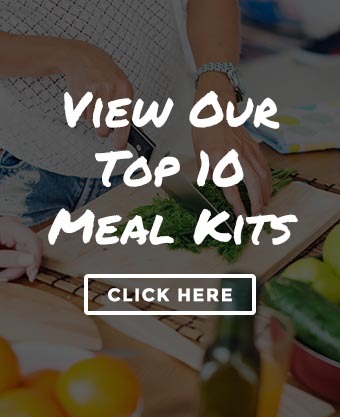 Though the meal kit industry has changed dramatically over the past decade or so, it is a trend you can expect to see grow and evolve with the times. What do you think about the meal delivery service industry? Which meal kit will be around ten years from now? Let us know in the comments below!